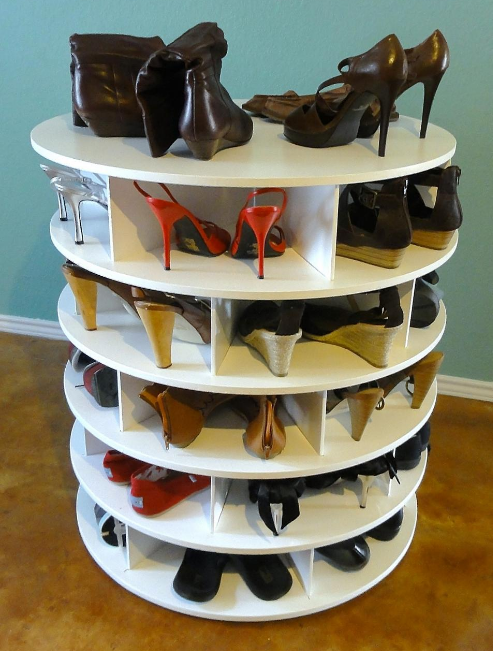 DIY shoe rack – Shoes are pretty little things that most women are willing to spend their money for. Not only women, but also men do the same thing to look stylish in a comfortable and convenient way. As a result, they begin to collect various kinds of shoes without knowing how to store them properly. Eventually, they only mess the house up. They do need a DIY shoe rack. DIY shoe rack can be the best solution especially for apartment dwellers since one of the most prevalent issues faced by them is the untidy shoes. It happens because there is not enough space to store and organize the shoes. And making a shoe rack is another tricky thing. But don’t worry! These 16 smart DIY shoe rack ideas will help you to cope with this storage issue as well as spruce your house up. A closet is a place in which you store clothes, shoes, and any other footwear. Many people have closet as the general storage in their house. Some homeowners even have built-in closets. Therefore, storing shoes in a closet is not a new and special thing. However, it can be special if you make a distinctive shoe rack by yourself. Ubiquitous closets are usually have one or two doors that need to be pulled if you want to open it. Then, the door is swinging away from the closet. Why don’t you try something new like a closet with hanging racks that can be pulled and pushed back to their position? It will make your closet look cool. A garage dooris usually constructed from rolling or sliding door which enable you to open it without breaking a sweat. You can apply that idea for your shoe rack so that it will add a modern to the room. Furthermore, getting the shoes that fit your outfit-of-the-day will be much more easier. To make this awesome rack, you can repurpose a wooden or steel drawer. Install some sliding drawer rails in the drawer along with the sliding trays. You will never realize how fast your shoes increased. When you begin to realize it, there is not enough space to store your shoes. To overcome this problem, an adjustable shoe rack will be your best bet since you can add some more racks with adjustable height. Now, adding more shoes to your collection will cause no problem anymore. This shoe rack provides some benefits and drawbacks as well. It enables you to put more racks. You can adjust the height of the racks. It will be hard to install the metal pole as simple equipments are not enough. The most important thing of a shoe rack is storing shoes. What is a shoe rack all about if it cannot help you organize your shoes better? Therefore, you need to focus on what really matters ── creating a shoe rack that enables you to store many shoes in place. This simple shoe rack will be your best bet because it provides several benefits. The design is so simple that you can include it to your next DIY project. It has many compartments that you can use to store your shoes neatly. Unfortunately, this shoe rack also has a drawback. The design is extremely simple so that it is somewhat tedious. Nothing can beat the versatility of woods sincethey can be turned into various kind of furniture including a chic shoe rack. This shoe rack is such a great rack. 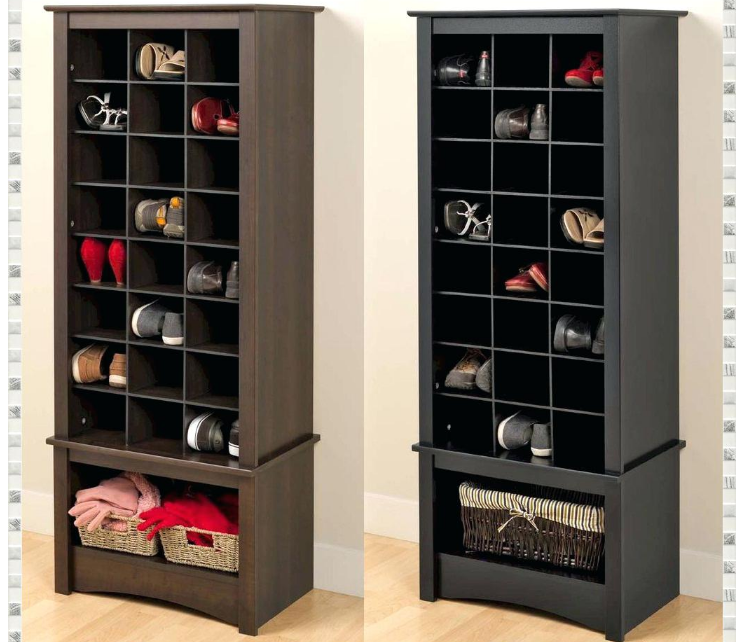 Not only can it helpyou organize your shoes, but it can also becomeexquisite furniture that can decorate your house. Instead of storing your shoes horizontally just like what you usually do in a regular shoe rack, you can try storing them in a different way ── vertically. The design of this shoe rack is suitable for a vintage or classic house that harnesses the unique of crafts. However, it does not suit a modern and minimalist interior that tend to use simple design with edgy shape. Every apartment dweller will love this shoe rack idea. It is extremely simple, stylish, and ── the most important thing── can help you store shoes. 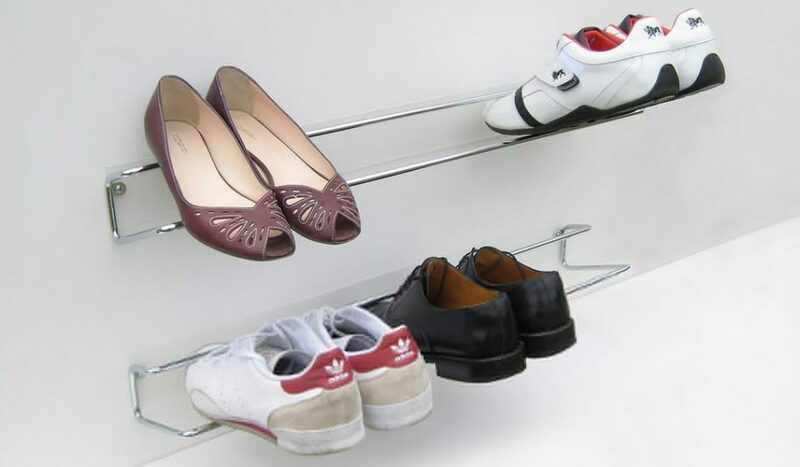 Wall mounted shoe rack can be the most brilliant solution for any homeowners having limited space issue. By attaching the shoe rack on the wall, you will not need extra space to put a shoe rack. The design suits any interior designs very well. You only need to explore your creativity in choosing the materials for the as it gives nuance. The design is so simple that every homeowner can build this rack without breaking a sweat. It suits any interior designs especially a modern house. It does not require much space, so it is such a brilliant solution for a cramped house. Since it attaches directly to the wall, it can damage the wall and leave dirty marks. Are you trying to iron storage problem out, but the limited space keep haunting you? Try this shoe rack idea. Instead of going horizontal, why don’t you go vertical? 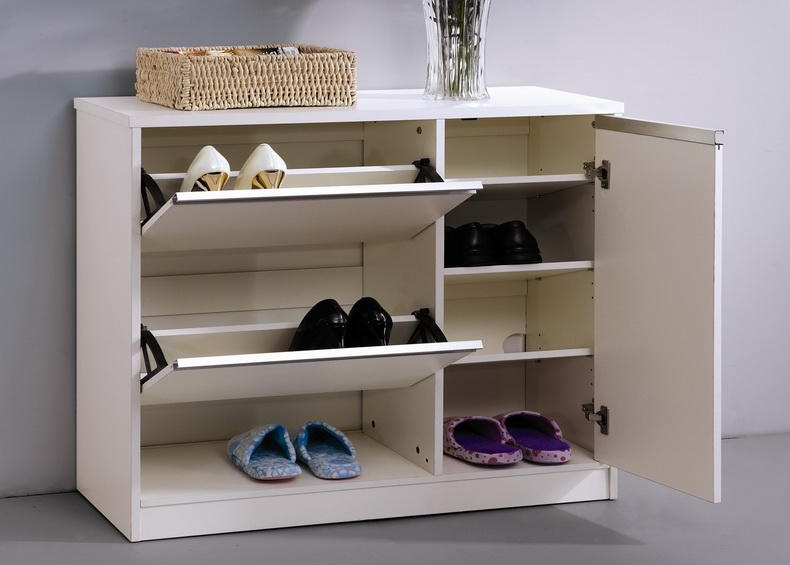 Putting a wide shoe rack entails space issue especially if you have limited space at home. It will be better if you expand the compartments of the rack vertically so that you can organize your shoes as well as sprucing up the room. Another quick fix of limited space ── wall shoe rack. 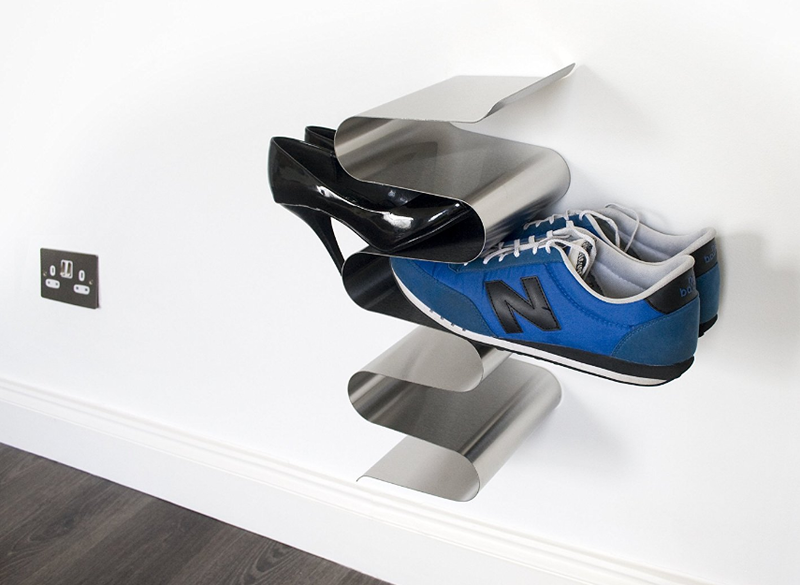 Unlike the usual wall mounted shoe rack, this one has taken shoe rack to the next level. The distinctive design will grab everybody’s attention because it is unique, bizarre, and brilliant. It really is a fashion statement. 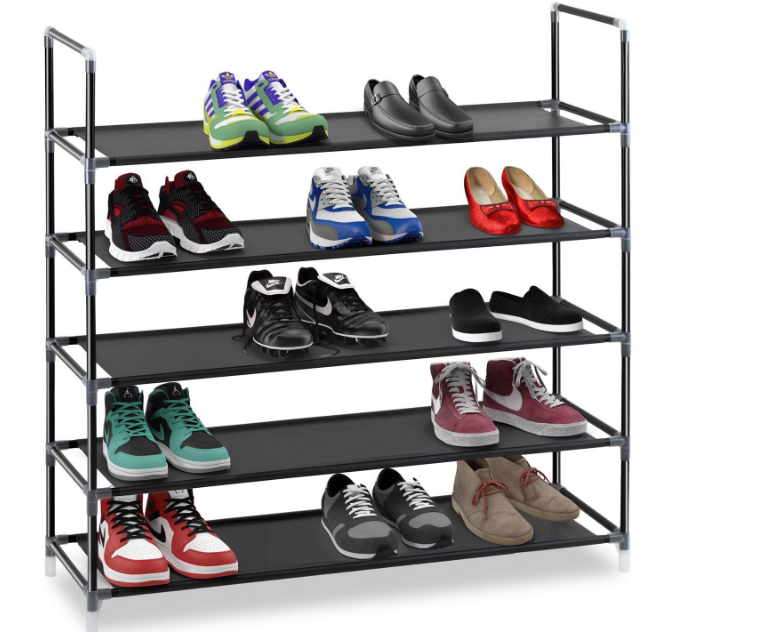 This wall shoe rack stores shoes vertically rather than horizontally, saving some more space for any other furniture. The design is eminently simple yet attractive. It is easy to build. You will only need a piece of iron sheeting, then bend it to form curvy shape. Attach the rack using a super adhesive substance to the wall. It saves more space as it is built vertically. The wall will be prone to damage if you directly attach the rack to the wall rather than the wainscoting panel. Storing and getting the shoes will require more time and effort since you need put the front parts of the shoes properly by pushing them into the curvy compartment. If you are in a rush, it will be a disaster for you. Pushing your shoes into the curvy compartment can gradually damage your shoes. If you have not made up your mind yet about what color you should use for your DIY shoe rack, you can always use paint it white. White is one of the most versatile color. It complements any color and suits any interior designs nicely. Whether your house implements minimalist, vintage, or even Victorian style, white shoe rack will always be an exquisite adornment as well as a smart storage rack. White shoe rack gives you many advantages. Painting the rack white can make it look clean, neat, and elegant. Since white is a neutral color, you can repaint the rack when you feel bored. Refurbishing a house might usually give you some leftover such as wood planks, tiles, or even PVC pipes. Do not get rid of the leftover so soon because you can still use them as a brilliant DIY shoe rack idea. 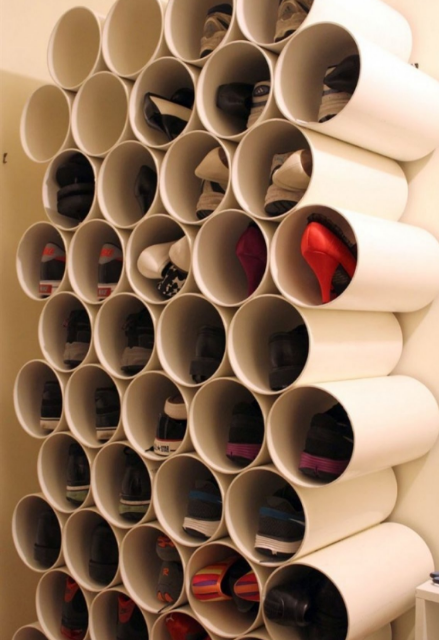 If you happen to have some PVC pipes, you can make a shoe rack that looks like a bee hive. This shoe rack will not only function as a storage rack, but also an exquisite and a creative accessory for your house. To make this creative shoe rack is merely a cinch. You only need to cut PVC pipes into some shorter parts with the same length. Apply some PVC adhesive substance, then arrange and attach those pipes on the wall. Storing shoes in a stackable rack is somewhat classic. However, classic is not always obsolete and old-fashioned. There a breadth of stackable rack types that you can find in the nearest store or even make it by yourself. This black stackable rack looks stylish and cool. Black color provides bold and masculine look to your rack. The simple design makes it suit any interior design very well especially modern home. Black color also one of the most neutral colors, thus you can put the rack in any rooms. If you want to salt away your money, you do not have to purchase a new shoe rack. You can make it by yourself. You will only need some small PVC pipes, plastic, or wooden dowels. Then, you can arrange them and make them stick to each other firmly by applying adhesive or simply add some screws. 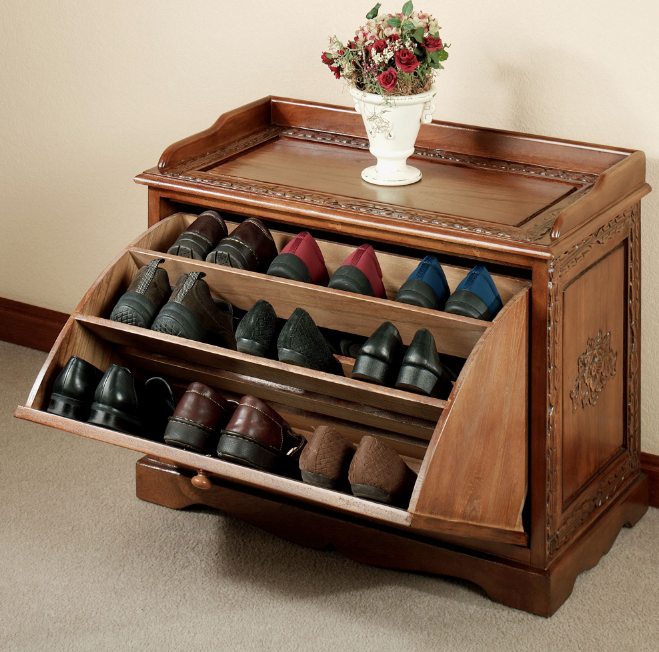 Another classic shoe rack that will keep your shoes tidy and organized well,a wooden shoe cabinet. 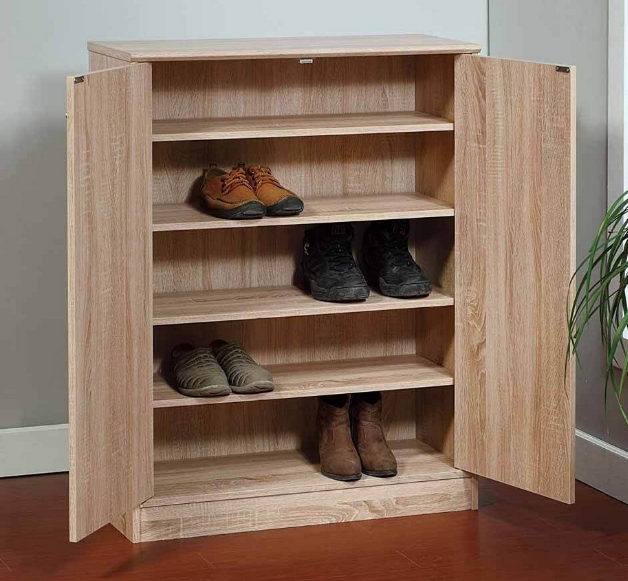 This cabinet has five compartments that you can use to store various kinds of shoes and slippers. As a classic shoe rack, it is made of wood since it consider to be sturdy. It has two doors that can be opened by pulling them and let them swing away the cabinet. You can either paint or stain the rack. Or you can just leave it as it is to inject the touch of natural. Having a 2-in-1 furniture will be a great idea because you do not have to spend more space. 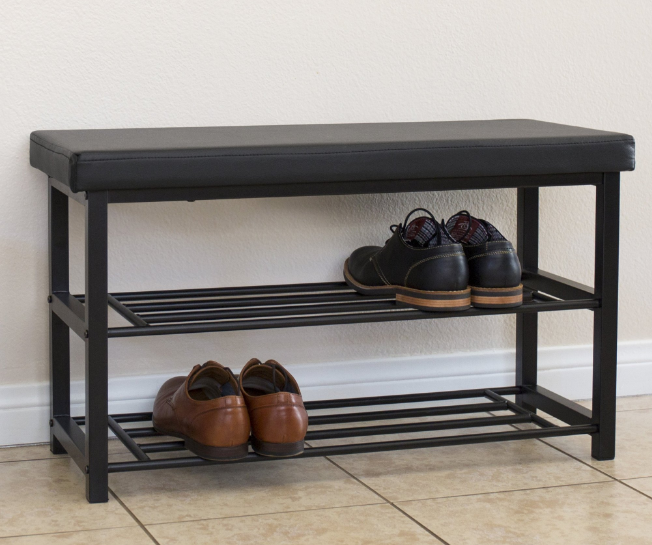 This shoe rack is such a great idea because it is the concoction of a bench and a shoe rack. Now, you can have a bench and a shoe rack at the same time without compromising the limited space. 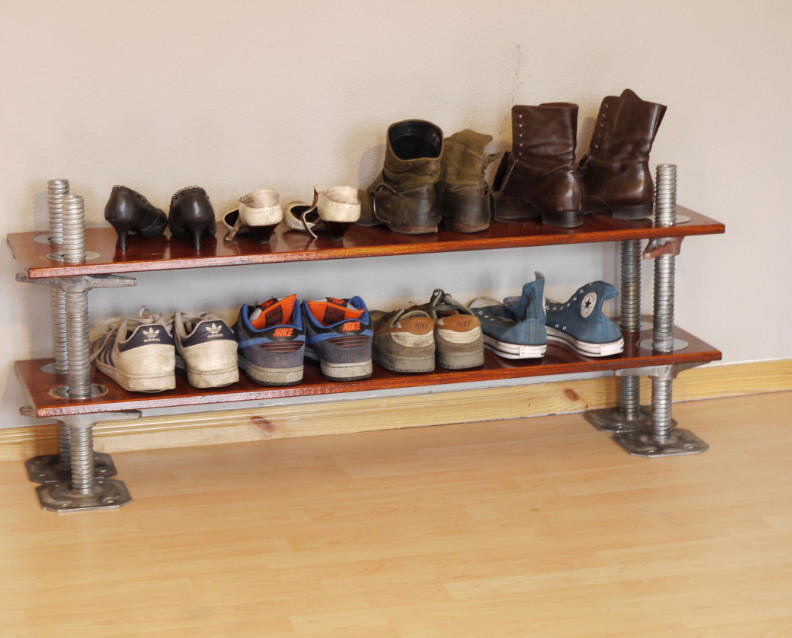 The bench shoe rack is made of metal which is absolutely sturdy and durable. You can try your shoes on while sitting on that bench before going to work or meet your friends. This stylish shoe rack is usually found in a fashion store and used for sunglasses display. You can rotate it left and right as you like to find the best sunglasses before purchasing it. Now, you can have this awesome rack at home and tweak it a bit by turning it into a shoe rack. To make this shoe rack, you will need 9 discs with 700mm diameter x 12mm plywood, 24 standard dividers sizing 250x150x12mm plywood, 5 tall dividers sizing 250x500x12mm plywood, 2 base length sizing 460x50x12mm plywood, 3 base length B sizing 436x50x12mm plywood, 6mm nails, PVA glue, 3 turntable swivel mechanisms, and mini roller. If you are a shoe-o-phile who is really into collecting shoes, this shoe rack will be your best bet. Looking for a DIY shoe rack on budget? Try this cardboard shoe rack. Just like its name, it is a shoe rack made of cardboard which, of course, is quite cheap and easy to make. To make this super inexpensive shoe rack, you are going to need cardboards, plastic corner guards, and heavy duty double sided tape. You can either leave the rack as it is or paint it to buck it up. It is easy to make. Even the materials are easy to find. It can’t be used to store many shoes. Those are 15 smart DIY shoe rack ideas that you can include in your next DIY project. Before making a shoe rack, you need to keep in mind what your objective really is. 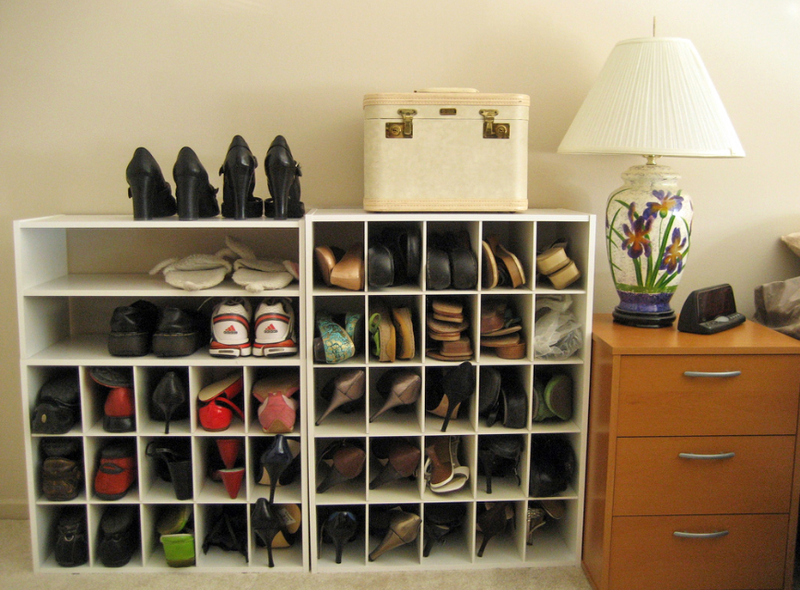 Is it to organize your shoes or simply refurbishing your house? Or maybe both? But one thing for sure, you need to choose a DIY idea that suits your budget well. A DIY shoe rack idea on budget does not always turn out badly. With the power of creativity, you can make an affordable yet fruitful shoe rack. So, which smart shoe rack idea will you choose for your DIY project?